Evan Evans Tours offer a range of Stonehenge Tours from London with options to visit Windsor Castle, the University City of Oxford and the beautiful Georgian City of Bath. Our Stonehenge Tours operate year round and include the world-class exhibition and Stonehenge Visitor Centre. During the summer we also offer Sunrise and Sunset tours with private access to the Stonehenge Inner Circle. A fascinating day out from London to three of our national treasures, Windsor Castle, Georgian Bath and Stonehenge. Tour includes entrance to Windsor Castle and Stonehenge with option to visit the Roman Baths. A full day escorted tour from London to Windsor Castle, the ancient monoliths at Stonehenge, and a walking tour through the University Town of Oxford. Tour includes entrance to Windsor Castle and Stonehenge. A full day, leisurely paced tour from London to Stonehenge and Georgian Bath, with plenty of time to explore. Tour includes Stonehenge entrance fee. A full day tour of the West Country visiting Salisbury Cathedral, mysterious Stonehenge and Georgian Bath. Tour includes entrance to Salisbury Cathedral with Afternoon Tea, and entrance to Stonehenge. PRIVATE VIEWING OF THE INNER CIRCLE AT STONEHENGE - an early start gives the opportunity to visit Stonehenge just after sunrise, followed by walking tours of historic Oxford and Royal Windsor. Tour includes entrance to Stonehenge. PRIVATE VIEWING OF THE INNER CIRCLE AT STONEHENGE - a later start to enjoy walking tours of Royal Windsor and historic Oxford, before a private visit to Stonehenge. Tour includes entrance to Stonehenge. Select Sightseeing - Full Day escorted tour from London to Windsor Castle, the ancient monoliths at Stonehenge, and a walking tour through the University Town of Oxford. Entrance fees are not included, but tickets may be purchased from your guide. Select Sightseeing - A Full Day escorted tour from London to magnificent Salisbury Cathedral and the ancient and mysterious Stonehenge, with a walking tour of Georgian Bath. Entrance fees are not included, but tickets may be purchased from your guide. Stonehenge is a prehistoric stone circle located in Wiltshire, England, about two hours drive from London. It stands on Salisbury Plain in Wiltshire, and is the most architecturally sophisticated and only surviving "lintelled" stone circle in the world, with massive horizontal blocks spanning across huge vertical standing stones. Its giant stones can be seen from miles around, but its true purpose remains a mystery today. Stonehenge evolved in several stages spanning at least 1500 years. The first monument at Stonehenge was a circular earthwork enclosure built in the late Neolithic period about 3000BC. The site was transformed in about 2500BC with the construction of a unique stone circle, while the final stage of construction was a ring of pits, made in the early Bronze Age, around 1600BC. There are two types of stones at the center of the monument: the large sarsens are up to 30 feet tall and weigh approximately 25 tons, and were probably brought to the site from the Marlborough Downs 20 miles away, but the smaller bluestones, which weigh up to 4 tons, were transported to Stonehenge from the Preseli Hills in south-west Wales, a distance of more than 150 miles. It's a mystery how Neolithic people using only the simple tools and technologies were able to bring the stones to the site, but most archaeologists believe that the stones were transported by human effort, via water networks and hauled overland. We don't know exactly why Stonehenge was built, but the stones are arranged to face the Midsummer sunrise and Midwinter sunset, and people may have gathered here for religious ceremonies. Still today, Stonehenge is sacred place of religious and cultural significance to many of the thousands of visitors who are drawn to the site every year. 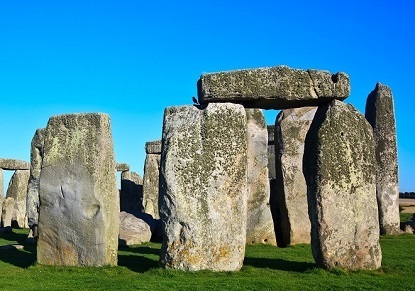 Evan Evans operate daily tours from London to Stonehenge. Visitors are not permitted to touch the stones, but are able to walk around the monument from a short distance away. English Heritage, who manage and care for Stonehenge, allow special access to worshippers for the summer and winter solstice, and the spring and autumn equinox. During the summer they also open up on certain dates for tour operators to offer sunrise and sunset tours with private access to the Stonehenge inner circle.